But of all the many things we do, this is the most important. Ever since the time of Clare, her sisters have prayed the Prayer of the Church - the Divine Office - the Liturgy of the Hours - it has many names - by day and by night, praising and worshipping God and celebrating the sacramentality of the day, the week, the year, liturgically. 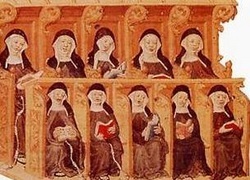 This illustration of Poor Clares in Choir singing the Office is from a medieval manuscript. At regular times throughout the day - morning, the beginning and middle of the day, afternoon, evening and at night-time - the sisters are in Choir, bringing to God all the needs of the world and the Church. Would you like us to remember any special needs of yours or of your family and friends?